Let’s start with the top. 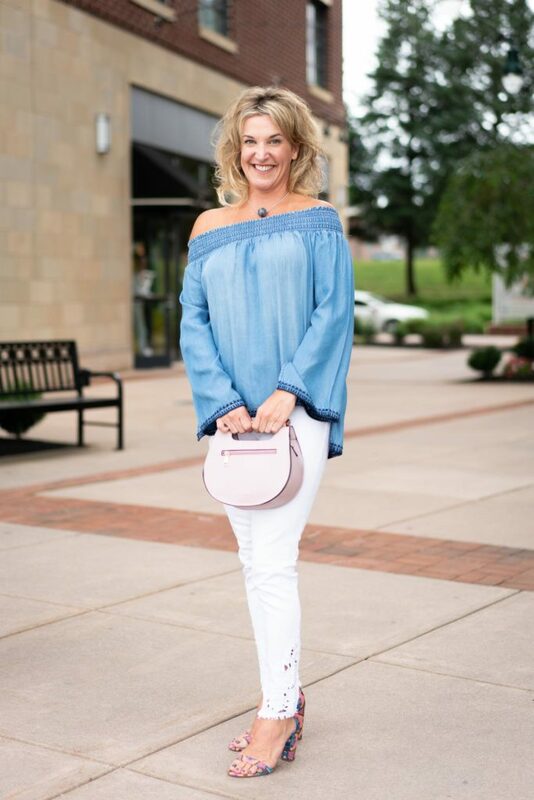 At first glance, it appears to be just a simple peasant top, but it’s much more than that. 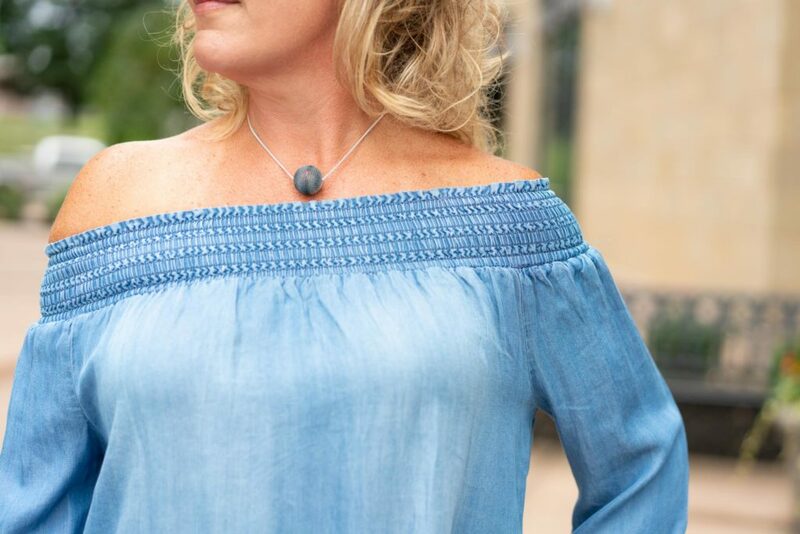 This top by Ariella is made of chambray, a lightweight woven cotton blend that looks similar to denim. Although this particular piece is long-sleeved, the breathable fabric makes it feel as though you’re wearing a tank top. Off-the-shoulder tops are at the top of the trend chart and we’re obsessed with this one. It’s all about the details. The ribbed ruching of the neckline provides structure to the otherwise flowy top. Navy embroidery edges the high/low hems and bell sleeves, finishing the look with a fun flair. You can never go wrong with a great pair of jeans. A timeless fabric, denim has the power to dress an outfit up or down depending on the cut and wash. This pair has a distressed hem and cutout details. We like these for summer because of the skinny cut and crisp white color. The best part? They’re sewn with stretch fabric. Comfort never goes out of style! The accessories are what really bring this outfit to life. We love this simple necklace that makes a subtle statement. The blue pendant picks up the navy of the top’s hems and isn’t too heavy. Adding a pop of color in the shoes takes this outfit to new heights. The minimalist block heeled sandal in this look creates the perfect canvas for the colorful pattern. 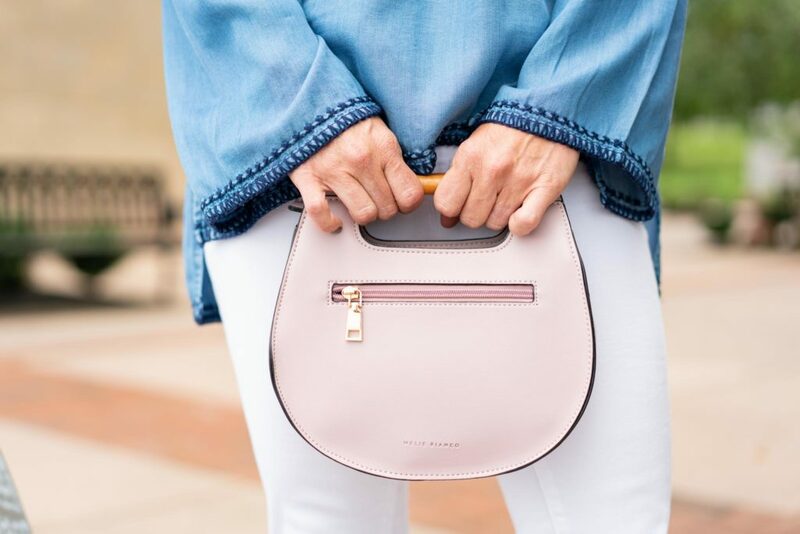 Our favorite element of this outfit is this pretty pink purse by Melie Bianco. A take on a classic baguette style bag, it’s large enough to hold your essentials without weighing you down. The one dress that can do it all. Style tips that will surely help improve your golf game.